On behalf of the Department I would like to congratulate all the students of Botany who bagged first prize in the interdepartmental competitions in Carol singing which has been organised on the eve of Christmas at Andhra Loyola College on 15-12-12. The Department of Botany organized a One day Regional workshop on Horticultural techniques on 14th Dec,2012. Forty five students from different Colleges participated in this Workshop. Mr. P. Balaji Kumar, Horticulture officer, Andhra Pradesh and Dr. B. Siva Kumari Head, Department Botany explained various techniques in Horticulture. Mr.Dhana raj, Mr. K. Srinivasa Rao technical persons from Dr. YSR Horticulture University explained the techniques in this field. To extend the realms of knowledge of students from what they read in their books to actual field of work and practical problems they encounter, the Dept. of Botany always strived to expose them to filed, plants and visualized what they are studying. In this connection various seminars by the resources person who have been working in the fields and are facing the current transitional trends have been conducted. Today is one such day and we are elated to have one day Workshop on Horticulture Techniques and to have our resource persons Ms. N. Sujatha AD, Dept of Horticulture, VMC, Vijayawada, MR. P. Balaji Kumar, Horticulture officer, Vijayawada Division, Dr. B. Siva Kumari, Head, Dept of Botany and Technical persons from Dr. YSR Horticulture University to open up our minds to different techniques in Horticulture by which we can propagate rare varieties and important ornamental plants. Sciences of all fields have been working together for a better world. And this Interdisciplinary nature of science and technology is now the very need of the hour. In this connection we need to encompass and improvise our basic and core sciences with the new trends on the rise. India with diverse soil and climate comprising several agro-ecological regions provides ample opportunity to grow a variety of horticulture crops. These crops form a significant part of total agricultural produce in the country comprising of fruits, vegetables, root and tuber crops, flowers, ornamental plants, medicinal and aromatic plants, spices, condiments, plantation crops and mushrooms. It is estimated that all the Horticulture crops put together cover nearly 11.6 million hectares area with an annual production of 91 million tones. Though these crops occupy hardly 7% of the cropped area they contribute over 18% to the gross agricultural output in the country. To meet the growing population needs India is in dire need of new trends in food production and horticulture is one such way that could pave way to serve this purpose. This Workshop intends to create an academic space and an awareness in each on of us that by our learning skills we may able to do the things by our hand and have the tendency to do many things in the society which will inspire many young and come forward and support the development of our society. In this connection I thank the members of the Management, Department staff members, Microbiology staff members for their support for organizing this Workshop. I am pleased to congratulate all the prize winners of the Intercollegiate Quiz Competition organized by the Department of Commerce at at Andhra Loyola College, Vijayawada. 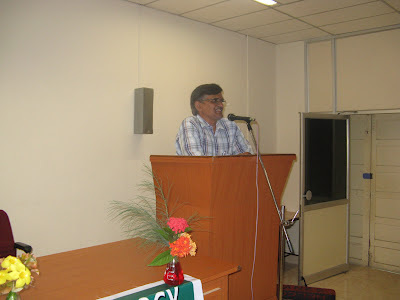 SAM- Workshop at Moulana Azad National Urdu University, Hyderabad from 3rd to 7th December, 2012. 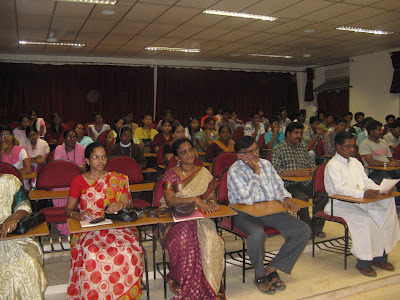 The Department of Botany, Andhra Loyola College, organized a Two day UGC Sponsored National Seminar on ' RECENT TRENDS IN NANOBIOTECHNOLOGY IN THE PROTECTION OF HEALTH 7 ENVIRONMENT' on 30th Nov and 1st December, 2012.
environment,’ 1 N7 Hall, 9.30 a.m. The various applications of Nano Biotechnology and their role in the field of medicine to cure different diseases were explained by Siddhartha Medical College Principal A. Krishna Murthy to the students of Andhra Loyola College. Speaking at the two-day UGC sponsored national seminar on “Recent Trends in Nano Biotechnology in Protection of Health and Environment” he explained to the students the connection between nano biotechnology and saving Mother Nature and the people. 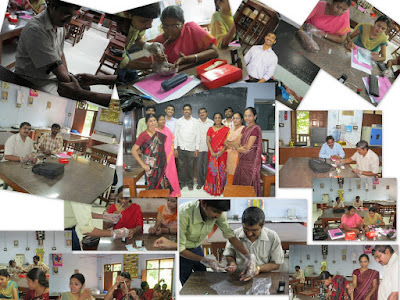 A detailed description was given about the usage of nano technology in medical field to save the lives of many. “There was a lot of scope in the field of nano technology,” he said. There are many applications yet to be explored in this field which can help mankind in many ways, he said. He further advised more students to opt for this course as the level of future opportunities in it were more. The seminar was inaugurated by the Principal Fr. G.A.P. Kishore, Rector Fr. D. Ravi Sekhar, Correspondent Fr. A. Francis Xavier, and Organising Secretary J. Chandra Sekhara Rao. Participants from all over India, in the city, to present their papers with different views on the topic, were welcomed by the Principal. Books on seminar souvenir, proceedings and a soft copy were released by the dignitaries on this occasion. A broad view of about nano technology, its application and future scope were given by JNTU Centre for Nano Technology Associate Professor K. Venkateswara Rao on the first day of this seminar. This was followed by paper presentations by the 120 participants from different colleges and universities. APPCB Zonal Officer A. Vijay Kumar, JNTU Professor A. Lakshmi Narasu, Krishna University Associate Professor B. Vijaya Lakshmi, ALC Botany Department Head B. Siva Kumari and other staff members were among those present at the seminar. 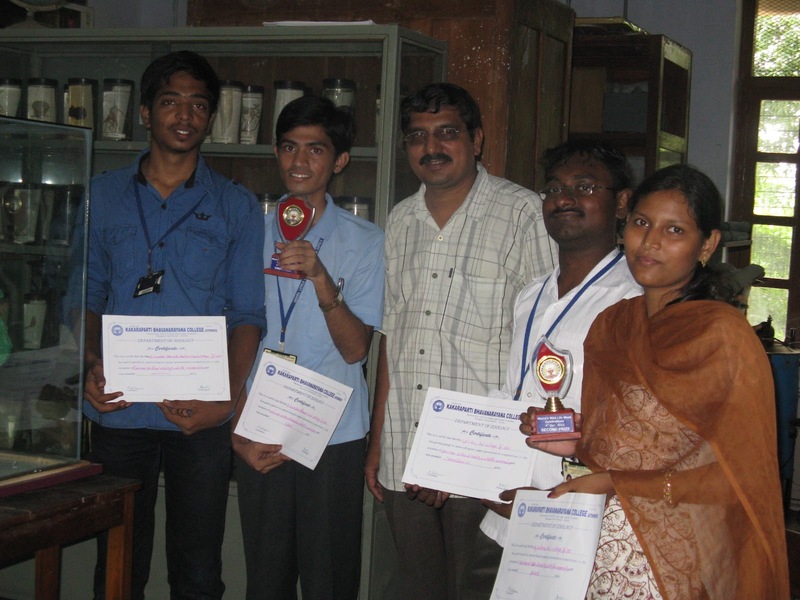 The methodology used in the preparation of Nano fibres was explained to the students of Andhra Loyola College by S. Shekar from Central Leather Research Institute, Chennai. At the second day of the national seminar “Nano biotechnology in the Protection of Health and Environment”, here on Saturday he explained to the students how a collagen sponge was made from fish scales. “Since collagen based nano composites are contrast agents they can be used for targeted delivery in Cancer therapy,” he said. The nano composites extracted from the scaled can be used in a paste form and when applied on cancer wounds they can be cured, he said. All this process was shown in a PowerPoint presentation for the better understanding of the students. The nano particles have anti-cancer drug nature which aid in the healing of wounds caused by Cancer, he said. Further he explained about SDA, TEM images of collagen, MRI images of apoptotic effect etc.